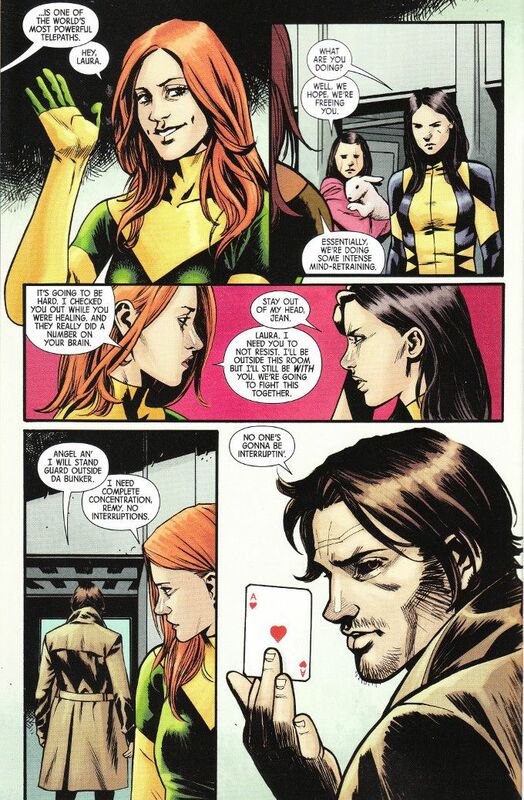 The good news is that Laura's friends in the X-Men have rescued her from the clutches of Kimura - an old enemy determined to turn the new Wolverine into her personal assassin. The bad news is that Laura is still trained to respond to "The Trigger Scent" created by Kimura and that Kimura's forces and SHIELD are still hunting for her. Jean Grey thinks she can undo the damage that was done to Laura's mind, but can she do it before they're all over-run by government agents and gangster thugs? This is a merely passable issue of what is normally an excellent title. As much as I'd like to blame the presence of the X-Men for this, the fault lies with the creative team. Tom Taylor is playing against his strengths as a comedic writer and a dialogist, with most of the issue devoted to scenes of heroes fighting heroes when SHIELD shows up. Thankfully, the revelation of Laura's "happy place"makes up for a lot. It does not, however make up for the inconsistent artwork. Djibril Moristte-Phan's inks obscure far too much of the fine detail and Michael Garland's colors are oddly muted and weak.